Transportation Costs > How Much Does a Limo Rental Cost? How Much Does a Limo Rental Cost? A limousine rental can be very relaxing and convenient for any occasion. It can also be quite costly, however, depending on the size of the limo needed as well as the amount of time you are renting it for. Occasions, such as weddings or proms, are the most common reason for a limousine rental, but a limo can be rented for many different reasons – even something simple like a ride to the airport. Most limousine rental services charge between $65 and $125 per hour for a standard eight-passenger limousine. According to Marriton Limo, this price varies according to the area you live in, the time of year, the night of the week, and the distance to be traveled. Keep in mind that most limo companies are going to have a two to a three-hour minimum. During the busier seasons, that number can be closer to the four to five mark. 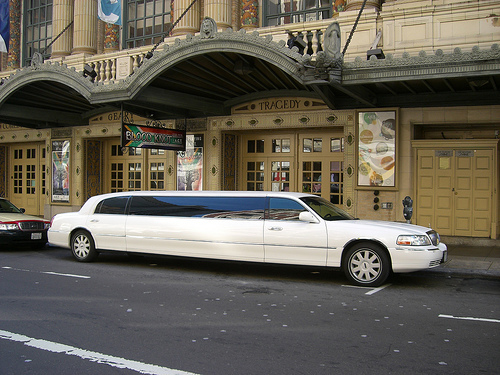 Stretch limousines, which can hold up to 14 passengers, can cost anywhere from $100 to $300. Limousines that hold 20 to 30 people, such as an extended Hummer limo, can cost as much as $400 per hour. Most limousine companies have packages for weddings or proms that range from $400 to $1000 for the entire evening. The limousine service will pick you up at the starting point of your choice and drive you to and from your destination. The driver will also wait for you while you attend the event. The limo charges won’t start until they pick you up from a certain location. Most limousines have a mini bar included, but underage drinking is strictly prohibited. There will be other refreshments available for groups under the age of 21. Some limousines have a screen where on which you can watch movies or some other type of entertainment. Some also have perks such as a laser light show included in the price. Gratuity for the driver is always expected but rarely included in the price. This tip should be between 10%-20%. If the gratuity is included in the price, it is usually a 20% tip. Some limousine companies have cheaper up-front prices, but then charge extra for things such as “per-stop” fees or gasoline. Be sure the company you are using gives you all the prices up front. Most limousine services have an extra charge if there is any damage done to the vehicle or if anything in the interior is ruined. Some companies require a deposit for this reason, which is then returned to you when the limo is returned in the same condition it left. Taxes, fuel surcharges, beverages and wait time can be considered an additional expense. It’s important to get the total price before hitting the road. Extra mileage fees may be applied if the limo has to travel outside a certain amount of miles. If the limo has to do a “meet and greet” at a local airport or destination, an additional fee may apply. Parking fees and tolls may apply if the limo company was charged during the trip. Usually a Cadillac or Lincoln Town Car. This type will fit up to four passengers. This is ideal for a quick trip to the airport. Allowing more legroom than the typical luxury sedan, this can fit up to four to six passengers. A stretch limo can fit anywhere from six to 12 people. The more people it can hold, the more it will cost on an hourly basis. The design will usually dictate how many passengers it can hold. These type of limos can hold up to 18 people. How long has the limo company been in business? Does the company currently hold any type of liability insurance? Are there are any complaints against the company? While the company won’t outright tell you this, check sources such as the Better Business Bureau. What type of vehicles do they have to rent? How many are available? How many people can it hold? If there is an emergency, will there be a backup that is available to use? What kind of features will the limo have? (TV, Bar) Can you drink in the limo? Are there extra fees that I have to know about that aren’t included in the original quote such as taxes, gratuity, taxes, parking, etc? If you’re going to have six people traveling in the limo, consider upgrading to one that will hold up to eight. This will give you more room in the limo, making it more comfortable. When agreeing upon a price, always try to get everything in writing. Some companies love to tack on additional charges that are hidden. Try to see the limo ahead of time. If you don’t have the time, try to find out what kind of make and model you’re going to get. The last thing that you want is to find out that you’re getting an older model. The simplest way to save money on limousine rental is to split the cost equally among all the passengers. Booking the limousine well in advance can save you money and hassle. It doesn’t hurt to consider avoiding a Friday and Saturday. These days tend to be the most expensive days to rent a limo. Some limousine companies have discounts for customers who frequently use their service. Calling around to different limousine rental services is the best way to compare the limo cost in your area. Ask questions like how much it is per hour, if they have any party packages for your type of event if the gas and gratuity is included, if there are any limits on the number of stops, etc. Ask people you know that have rented limos before if they know of a good company. Be sure the company is licensed by the state to avoid being left by the driver or charged extra once the driver arrives.